If you find yourself stuck in your traditional sales job and you’re looking for new ways to increase your sales, I challenge you to think outside the box and get out of your comfort zone. And one way to do this is to consider doing a podcast or become a podcast guest. 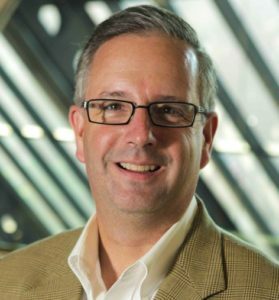 Today, Tom Schwab shares about how you can grow your business through podcast. Tom is the author of Podcast Guest Profits: Grow You Business with a Targeted Interview Strategy. Tom is the Founder of Interview Valet, a premium podcast guest marketing agency that helps people get their message out as a podcast guest as well as connect them with people who could be their ideal customers. Four years ago, I started The Sales Evangelist on the side as I had a full time career doing traditional sales. Today, I am now doing podcasting full-time so listen in to find out how you too can leverage the power of podcast. Connect with your ideal customers. Repurpose your content into a blog post or other forms of content. The interview is just the fuel but what you need is the engine (which consists of these 6 steps) to turn that fuel into business results. Find the ideal podcast that has your ideal customers. There are 350,000+ podcast out there but there is always a niche for each person. Niche down and find out who you want to be speak to and be very specific. Consider both the psychographics and demographics. Start to think of what podcast they could be on. 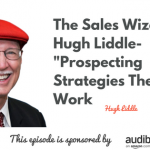 If you’ve already got prospects, ask what podcasts they like. Check out the New and Noteworthy section of iTunes. Do a Google search of your topic and the podcast. The worst sales call you can make is one that is totally cold and has no value to the person you’re selling to. So make sure you and the podcast host are a good fit. Make sure it’s not a cold pitch by focusing on what you can help them with and what you have for the audience. Your goal in being on a podcast is to make the podcast host look like a genius for having you on because you shared so much value. Before reaching out to the host, listen to a few episodes and figure out what value you can offer them. Leave them a rating and review. Share their content. Write some comments. Do that for a week or two before reaching out. Know who the audience is and who the host is. Know the questions to be asked. Help the host prepare for you. Give them a one-page brief sheet that gives them your bio or some questions they could ask. Give a link to your LinkedIn profile or a talk you did. IN short, make it easy for them to have a great interview with you. Talk about the different things on your site to get people from being listeners to visitors to leads by giving resources like infographics or a 30-minute training. Give them a way to go to your page. 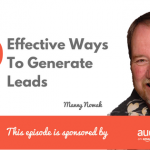 How can you move them to the next step from being listeners to visitors to leads? Put yourself in the listener’s spot. Most people don’t want another newsletter so make it easy for them. The best way to do this is to send people to a dedicated landing page. What you want to make sure is you want to give them a good experience when they go there. This is how you and supercharge your interviews. This is new content for people who just found out about it. Once you start promoting episodes, you’re much more likely to get on other podcasts. When people get to the landing page, there would be three ways for them to say yes. Not everybody who listens to your podcast is ready to engage with you so give them a little yes, a medium yes, and a big yes.